Some great cities offer sights that look almost as good at night as they do during the day. Palermo is one of them. This is remarkable for a "secondary" city that you usually need a connecting flight to get to, but Palermo's civic administration has made a serious effort to promote the place in every way, and flattering lighting is a good example. Of course, any competent photographer will tell you that the best "night photography" really takes place at dusk when the electric lights have been turned on but there's still just enough ambient light to ensure that your subject is completely illuminated in a natural way. Follow that advice and you may even capture backgrounds such as a usually-elusive violet sky. Nowadays the "great debate" is Film versus Digital, and rarely is it as lively as when discussing night photography. What should be considered is that even with a digital camera you may need a tripod and time-exposure to capture certain scenes or duplicate some of the interesting effects of film photography --things like the streaks of light resulting from passing vehicles. Here's a quick guide to what's available and (usually) well illuminated. Opera houses: The Teatro Massimo is a spectacular subject just before Christmas, when it is decorated with an array of lights, but this opera house, and Politeama a few blocks away, are always interesting. The Massimo is neoclassical while Politeama represents a kind of "Pompeian" classical. Porta Nuova: Parts of this arched gate date from the fifteenth century. It is interesting from either side --Piazza Vittoria or Piazza Indipendenza. The Norman Palace is nearby. Norman Palace: From either side, Piazza Vittoria or Piazza Indipendenza, this is an interesting subject on high ground overlooking the surrounding gardens. The Pisan Tower visible from Piazza Vittoria is largely medieval. The pointed battlements and Gothic facade on the Piazza Indipendenza side are later additions but still beautiful. St. John of the Hermits (shown): Located near the Norman Palace, this Norman-Arab monastery with reddish cupolas is visible from the street at night. Stunning. Cathedral: Illumination here is amazing, and the setting offers numerous angles from which to photograph, from the apse to the front portal, arches and towers. Steri Castle: Located in Piazza Marina, this structure offers interesting details such as its arched two-light windows. St. Francis of Assisi: This Romanesque-Gothic church is located in its own small square. During summer there are tables set up by the nearby restaurant but the facade is still visible. Quattro Canti: This Baroque treasure is usually illuminated at night, and during the Christmas season and certain festivals, such as St. Rosalie in July, the street is decorated with lights. 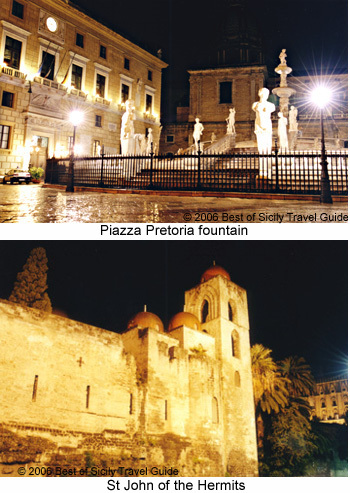 Piazza Pretoria (shown): The statues of this Baroque fountain stand out as a brilliant white against colourful backgrounds formed by the surrounding buildings, mostly churches. San Cataldo: This church and the Martorana nearby are not usually illuminated by special lighting so get there just after sunset to take advantage of the fading sunlight. About the Author: Architect Carlo Trabia has written for this publication and others.